Goodell Disproves Deflategate. (No, Not That Goodell...) : The Two-Way A seventh-grader named Ben Goodell created a science project to try to prove Tom Brady and the Patriots didn't tamper with the inflation of footballs, as maintained by NFL Commissioner Roger Goodell. 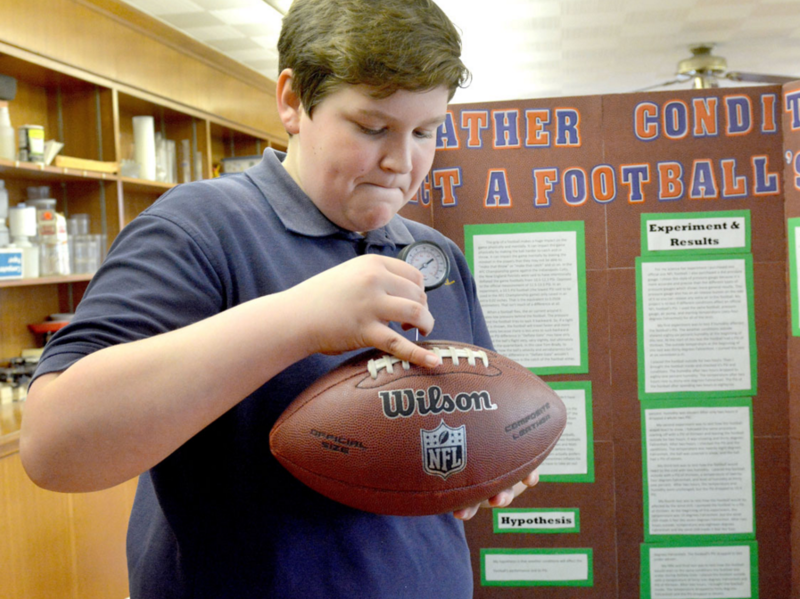 Ben Goodell, a seventh-grader in Lynn, Mass., created a science fair project measuring how weather conditions such as humidity, snow, wind chill, cold and ice affected the PSI of footballs. While most of the country would be happy never to hear the word "Deflategate" ever again, people named Goodell are still very concerned with the year-old scandal and whether New England Patriots' quarterback Tom Brady tampered with game balls. NFL Commissioner Roger Goodell — whose four-game suspension of Brady was overturned by a judge — is likely keeping a close eye on the Deflategate case as it winds its way through federal appeals court. But there's another Goodell committed to proving Brady didn't do it. Ben Goodell, a seventh-grader from Lynn, Mass., dedicated his science fair project to measuring how weather conditions affected the PSI [pounds per square inch] of footballs in a bid to prove the Patriots did nothing illicit. "I wanted to prove that Tom Brady is innocent," the 12-year-old St. Pius V Elementary School student, who isn't related to the NFL commissioner, told local TV station NECN. Goodell was one of approximately 120 students who participated in the school's annual science fair, and one of only eight to win the Outstanding Project Award, according to The Daily Item. The newspaper reports Goodell began his experiment with a football inflated to the NFL standard and then exposed it to different weather conditions, including humidity, snow, wind chill, cold and ice. "Every time, it dropped two PSI [pounds per square inch]," Goodell, a Patriots fan, told the Item. "The lowest PSI recorded during deflategate was 2 PSI under proper inflation." Principal Paul D. Maestranzi said the goal of the science fair is to get students to try and answer an everyday question. "It's more tied in with current thinking," he told the newspaper. "I think some people think science is only in a laboratory. It's really all around us all the time. That's what gets kids hooked: relevance." So, kudos to Ben Goodell for his experiment. Hopefully, Deflategate — the stale and bungled controversy that it is — will soon cease to be relevant.